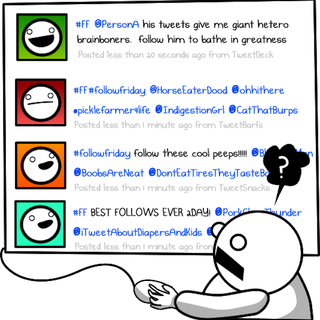 Every Friday, many of us will watch our Twitter streams fill up with lists of users and variations of #ff and #followfriday hashtags. Is this really how that whole thing is supposed to work? What would be better? Republished with permission from Matthew Inman aka "The Oatmeal," a former web designer turned comic artist. You can see more of his work on The Oatmeal. Matthew is a one man operation, so be sure to check out posters and prints from his shop.